Meet Malibu! Malibu is about as perfectly behaved a dog as you will ever meet. She is my mobility service dog and the picture above was when we were out shopping this week at Target. 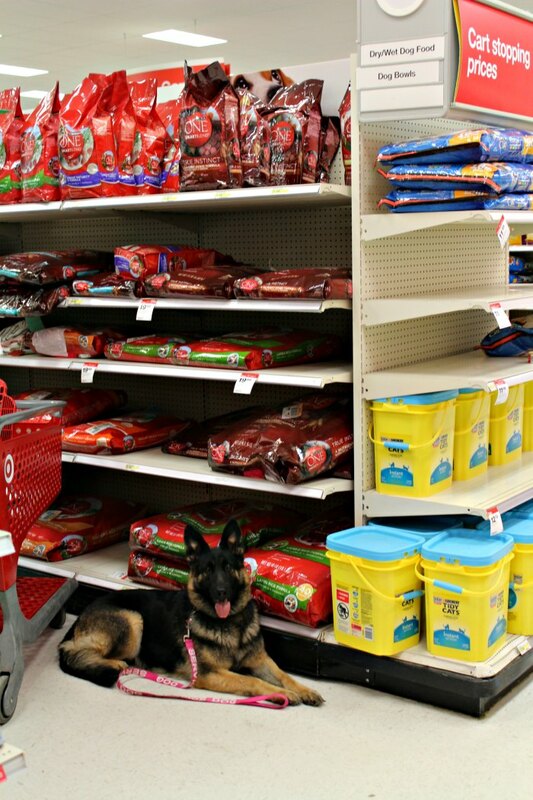 She even is a good girl when being tempted by all the delicious smells of her favorite, Purina One®, in the dog food aisle at Target®. 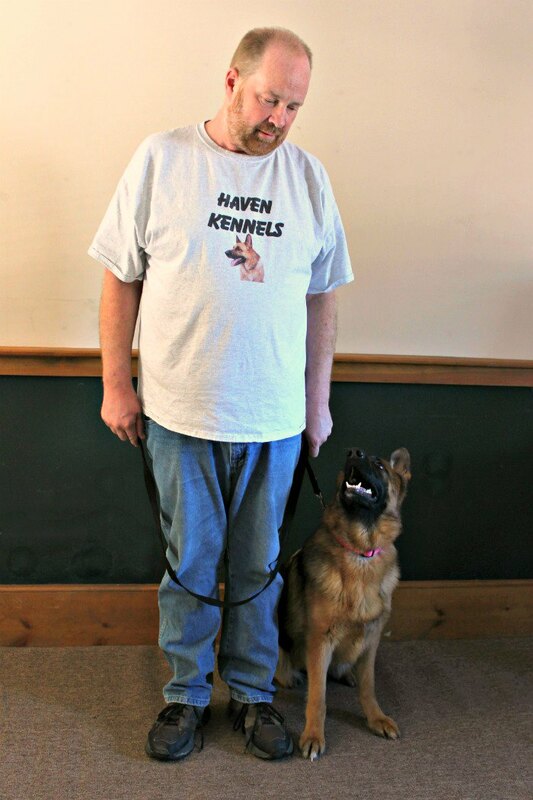 Not only do I use a service dog, but we breed and train service dogs. 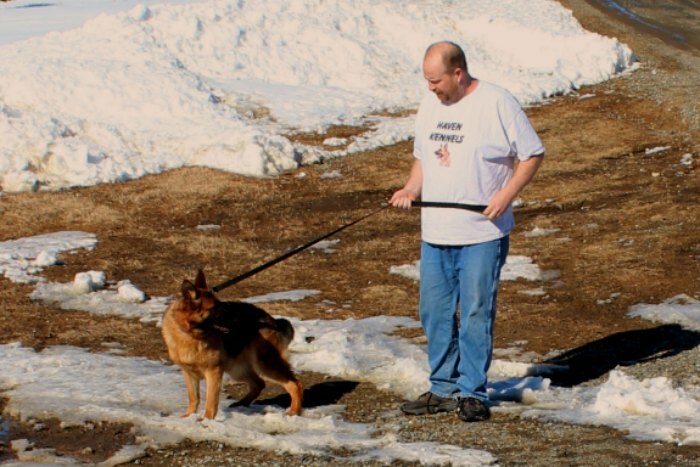 One of the most important parts of a service dogs training is to only defecate and urinate when it is appropriate and they are allowed to. More dogs end up in shelters and rescue because of housebreaking issues! The sad thing is that most new dog owners don’t know how easy housebreaking can be and end up with stained carpet, chewed furniture, piles of dog poop to clean up, and an embarrassing smell in their home. For those reasons many dogs who were adopted with the best of intentions end up in shelters and rescues, and eventually euthanized. All that heartbreak can be avoided if you understand a little dog psychology and are willing to set up a schedule and stick to it. It is built into a dog’s DNA to be clean. It is their natural instinct. When a mother dog has her pups in the nest/den, she is constantly licking them and cleaning them, The pup digestive system is triggered by the licking so when the pup is licked it urinates and defecates and the mother dog cleans it up. I know – that sounds pretty disgusting to us humans but dogs don’t use disposable diapers. The mother dog in the wild was insuring that her helpless pups would be safe from predators when she was away from the nest while she was hunting. Eliminating the chance of telltale odors that might attract predators is very important. So dogs want to be clean and they will never soil their “den” if they can avoid it. We use that information to our advantage by putting the puppy in a wire kennel crate to contain it. 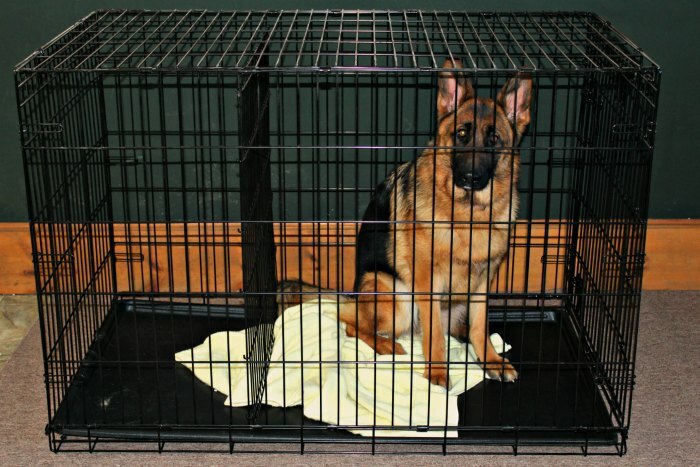 For economics, you can purchase a crate with a removable divider so that you can adjust the crate to fit the pup and expand it as the pup gets larger. If the pup was given the full size crate she would go and pee in the furthest corner and then go back to her blanket nest. The pee in the corner isn’t in her nest so she doesn’t care. So her “den” must be small enough that she can just turn around in it and lay down. Some people think that it is mean to put the dog in a “cage”. Our dogs learn that their crate is their safe place and actually will go lay in their crate on their own. We always crate our dogs when we leave home. It is the safest thing for them and our house when no one is available to supervise. Your new puppy hasn’t learned that the entire house is the family’s “den” and that will take time. So in the meantime, never leave your puppy to wander around the house unsupervised. If you can’t be supervising the pup, put the pup in their crate. As you correct the pup on what it can touch and not touch, where it can go and not go, you will be able to expand its range and eventually the pup will recognize the entire house as its “den” and will not soil it. Only leave your new dog loose in the house when you are able to be there to supervise it. Provide it with toys to play with. 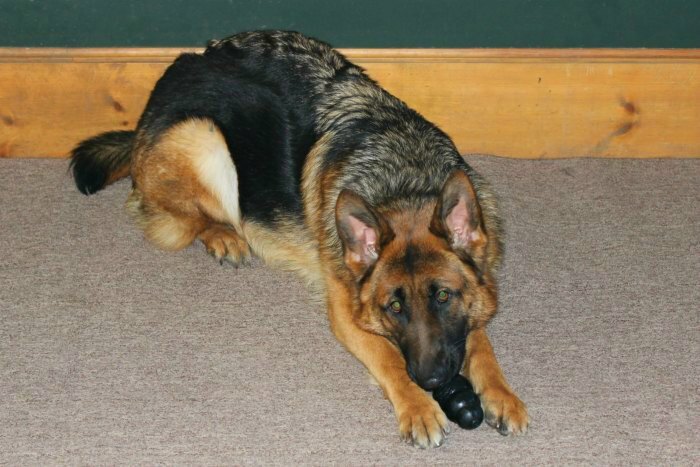 An excellent toy for a German Shepherd is a “kong” that is hollow so you can stuff it with Purina One kibble. It keeps the dog busy trying to get the kibble out. The next item to address is scheduling. Consistency is going to be the key to a successful toilet training of your dog and that means setting a schedule and sticking to it. Dogs are creatures of habit and the more you can keep them on schedule the less pee and poop you will have to clean up. A young pup will have to go outside more often than a full grown dog. The rule of thumb is to take your pups age in months and add +1 to it – this gives you the number of hours your pup will be able to hold its urine. A 12 week old pup needs to go out every 3-4 hours. The defecation can be controlled a little more easily. Your pup as a rule will have to defecate 15-20 minutes after eating. Feed your dog twice a day. Take away the food dish when 15 minutes is up whether the dog is done eating or not. Wait 20 minutes and then take the pup outside. Hey Daddy! I’ve got to go pee! The combination of walking and timing will get you the result you are looking for. Always take the pup to the same spot so he can smell wear he has gone before. Praise the pup and give a word command as it poops and pees so it begins to associate the word with the action. When the pup has to go, it has to gooooo! No time to waste even if you have to go out in the winter cold without a jacket. Just in time! What goes in must come out! Quality of food is also important. Feeding a food containing more protein and no grain makes for small tight stools and actually cuts down on dog flatulence. 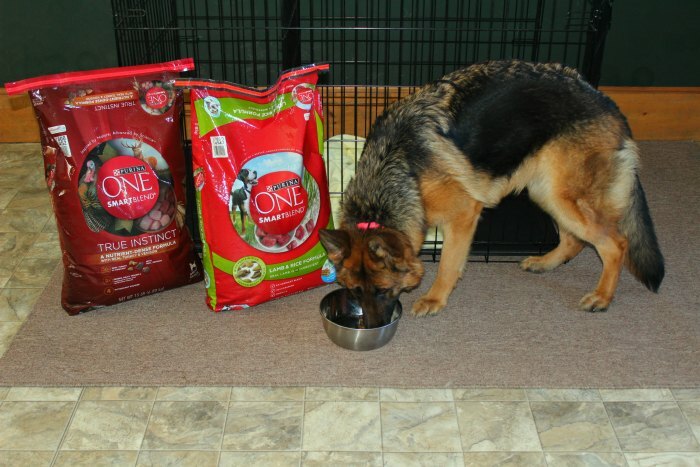 We find that Purina One provides all the nutrient requirements we have for our dogs. Brie, Malibu’s puppy, loves her Purina One® Smartblend® Lamb and Rice Adult Formula Premium Dog Food. 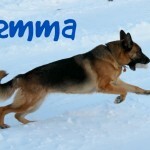 As German Shepherd breeders we realize that our dogs diet is important to keeping them in top condition. Because German Shepherd puppies grow incredibly fast, we switch to them to a quality adult food at 4 months. If fed puppy food for any longer their skeletal structure will grow too fast and that will lead to joint problems later on. The Smartblend Lamb and Rice contains natural sources of glucosamine that support healthy joints. A good source of glucosamine is also important to help a German Shepherd pup’s ears stand straight as the glucosamine helps the ear cartilage strengthen. Mom Malibu’s favorite is the Smartblend True Instinct with Real Turkey & Venison. The Omega-6 fatty acids help give Malibu a luxurious coat and healthy skin. 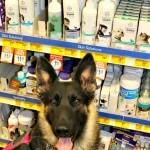 Because Malibu is a valuable breeding and service dog, we trust Purina One to keep her strong and healthy. 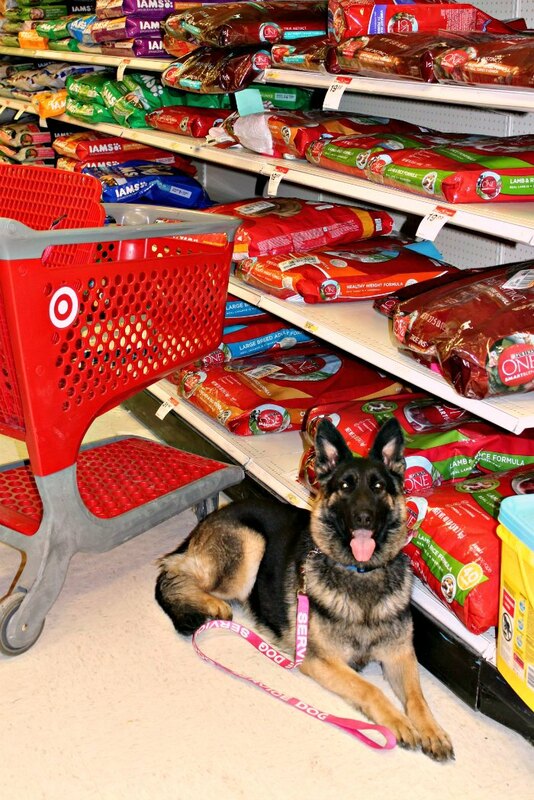 Because Malibu is a mobility service dog she is well behaved in a store like Target® even when presented with the temptation of all that delicious smelling Purina One. 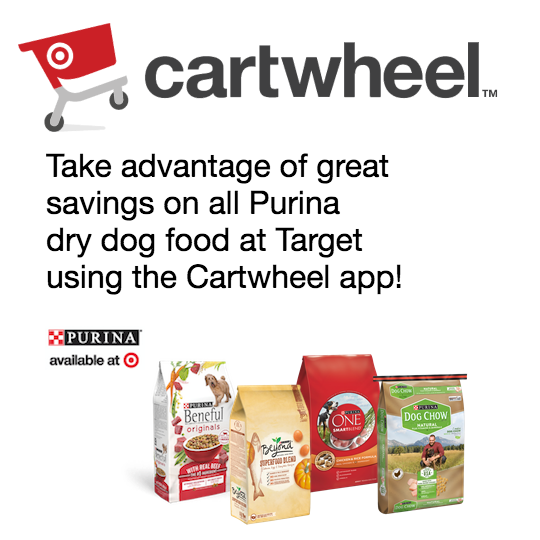 This month Target and Purina are having special pricing. Click on the image below to see the great values available.